Domaine Marc Sorrel with its 4 hectares has built its reputation due to its fabulous red and white Hermitage vintages. As a homage to the Northern Rhône Valley wines, Marc Sorrel respectfully and passionately grows Syrah, Roussanne and Marsanne, the traditional grapes of the area. The single vineyard plots called "Le Méal" and "Greffieux" are superbly exposed to ensure the ideal ripening of the Syrah grapes. 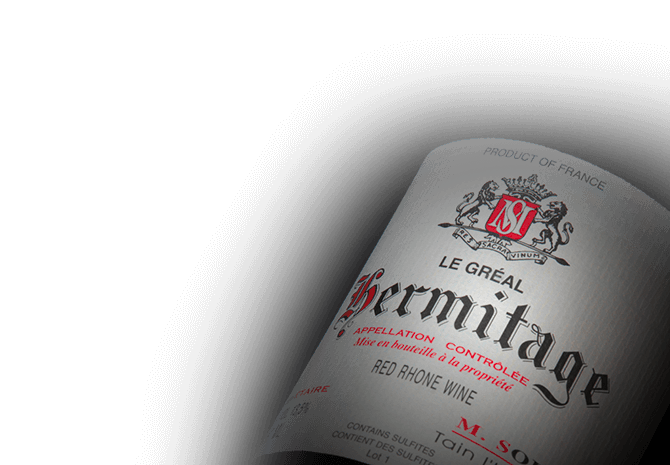 They are the blend’s core of the iconic red Le Gréal. The prestigious limestone hillside of "Rocoules" is the origin of a white Hermitage produced in very limited quantities. It has a racy, powerful style that displays incredible finesse. As a key benchmark in the Northern Rhône Valley, the talented Marc Sorrel embodies the elite of the biggest names in Hermitage. The Hermitage hill enchants all those that step foot upon it: from American president Thomas Jefferson who believed Hermitage white wines were the best in the world to celebrated wine critique Robert Parker who rated the 2003 Hermitage Gréal with 96 points. The family-run Domaine Marc Sorrel is also under the spell of the Hermitage Hill and has been exquisitely crafting world-renowned artisanal wines for three generations from their vineyards spread out over the Hermitage and Crozes-Hermitage appellations. Legend has it that a knight from the Crusades became enchanted with the hill and decided to plant vines on it in the 1200s. He lived out his life in solitude with his vines. Hermitage actually means “hermit’s hill” – an ode to one of its earliest residents. Unlike the hermit knight, Domaine Marc Sorrel has been a dynamic force in the Northern Rhône as being truly unique for elaborating both red and white cuvées that have achieved acclaimed status as terroir-drive wines with the purest of fruit. The family-run Domaine Marc Sorrel spans three generations that started with Marc Sorrel’s grandfather, Felix. He bought land and set up the Domaine in 1928 to initially sell grapes. Henri, Marc’s father, took over the estate and continued to sell the estate’s grapes, but then eventually decided to make wine himself. In 1982, Marc Sorrel took the helm and started to experiment with his non-interventionist, traditional approach to craft his cuvées. Since then, Marc Sorrel has become one of the most celebrated producers in Hermitage enchanting the world with wines of exquisite finesse – cuvées orchestrated with the upmost respect for the vines and their terroir. 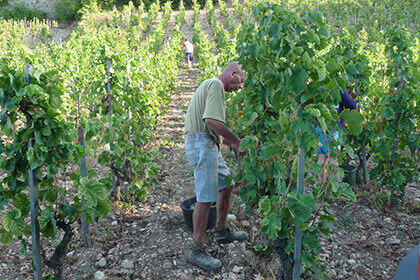 Domaine Marc Sorrell has four hectares of vineyards across the Hermitage and Crozes-Hermitage appellations with two that were inherited from his family and two that were acquired later. In his Hermitage and Crozes-Hermitage vineyards, and the rest of the North Rhône Valley, Syrah is the superstar variety. It’s easily recognizable with its signature deep purple, inky hues. 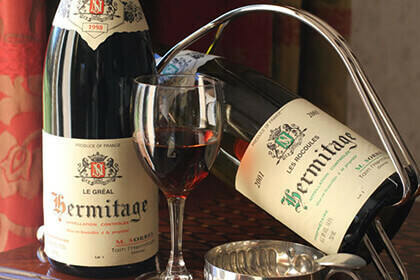 The wines from Hermitage usually need five to ten years before you open them, and when you finally can pop out the cork. The Hermitage hill consists of three adjacent south-facing hills with varying soils: granitic clay to clay-limestone to sandy clay. Wines from granitic clay or clay-limestone have more tannins and body while those from sandy clay have a little less tannin and can be drunk a little earlier. 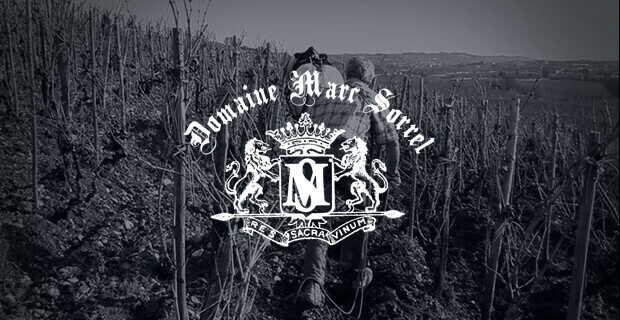 Domaine Marc Sorrel has its Syrah plots in the Bessards, Greffieux and Plantiers vineyards. He also has a section in the Méal vineyard, one of the most prestigious in Hermitage, where his vines are planted around the middle of the hillside, which benefit from the warmer micro-climate than other parts of the slope. From this plot comes the celebrated Hermitage Rouge “Le Gréal”. Many of the Crozes-Hermitage Syrah vines, however, grow in granite-clay soils that have sand mixed into them. The sand usually lightens up the colour of the wines, and perfumes them with more floral aromas. Now for the white varietals, Marsanne and Roussanne are important players in the Northern Rhône. Marsanne especially often doesn’t get the attention it deserves since it usually ends up playing a supporting role to Roussanne. However, Domaine Marcel Sorrel gives his full-fledge attention to this variety in its white cuvées that spotlight this fleshy grape with moderate acidity. It’s richly coloured and gives demure wines with restrained fruit and delicate floral aromas. Roussanne is indeed one of France’s greatest white grape varieties, but it doesn’t get the fame it deserves partly because it’s a tough vine to grow in the Rhône Valley. The blasting Mistral winds from the north can snap off its fragile branches, and then when the winds ease up and the rain starts, it becomes vulnerable to fungal diseases. Nevertheless, its wines are fresh in character due to its high acidity and it offers a beautifully perfumed bouquet of aromas like spring blossoms, citrus, peach and pear. Domaine Marc Sorrel’s Hermitage Blanc “Les Rocoules”, as the name conveys, is from the Rocoules plot while his Hermitage Blanc that is 100% Marsanne comes from a plot in the Greffieux vineyard, which is just below the Méal vineyard. Because of Hermitage’s steep hillside, vineyards on these slopes have to be hand-harvested – definitely no easy feat at all for the vineyard workers. Once the grapes reach the winery, some of them may be destemmed before they end up in the vats for fermentation, it just depends on the style of wine. Using whole clusters will give the wine a bit more complexity and silkier tannins. This is especially important if the vintage has grapes with high acidity since the stems can help round out the balance in the wine. On the opposite end with a high ripeness vintage, the stems give freshness to the wine. Keep in mind that fermentation can either be done in vats or in oak barrels. Domaine Marc Sorrel’s white wines all see fermentation in old oak barrels for eight to ten weeks, and the premium ones will have some ageing on fine lees, which are the leftover yeast particles after fermentation. This type of ageing adds textural creaminess to the wine. You’ll also be able to notice aromas that come from the fine lees like toast, brioche or elderflower, or even a bit of nuttiness. Additionally, the oak-barrelled fermentation adds aromas as well like caramel, smoke, cloves or vanilla. For the Domaine Marc Sorrel red wines, they’ll be aged in old oak barrels for eight to 24 months, which helps smooth out the tannins and add oaky aromas to the wine. These exceptionally unique wines from Hermitage and Crozes-Hermitage reveal the magic of these appellations with every single whiff and sip of them. The pièce de résistance is the Cuvée Prestige Hermitage Rouge “Le Gréal”. 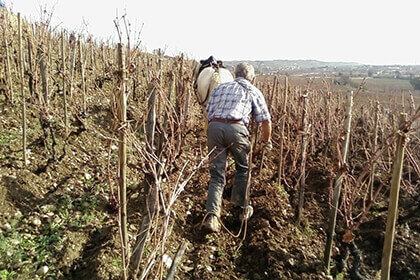 The cuvéee is from a Méal plot in the heart of the Hermitage hill and from 60-year-old vines. The blend consists of 90% Syrah and 10% Marsanne. It is aged in old oak barrels from 18 to 24 months, and remains unfiltered. The colour of this wine has a deep, dark purple hue that is almost ink-like. The bouquet expresses floral and dark fruit aromas like violet and cassis along with hints of musk and leather. The palate is fleshy and powerful with harmonious tannins. The wine is a definite keeper since its ageing potential is from 15 to 20 years! Another extraordinary red is the Cuvée Classique Hermitage Rouge from 30-year-old Syrah vines planted on a plot in the Greffieux vineyard. This Syrah wine is aged in old oak barrels from 18 to 22 months. This beautifully orchestrated wine shimmers with a garnet colour and dark fruit aromas like black berries overflow from the glass. It has finesse on the palate with majestic balance. Time is an ally of this cuvée since 5 to 10 years of cellaring will reveal more of its supple and silky personality. For the crown jewel of Marc Sorrel’s white wine is no other than the Cuvée Prestige Hermitage Blanc “Les Rocoules” that comes from one of the most prestigious plots of the appellation, Rocoules on which 50-year-old vines root themselves. This cuvée is an unfiltered blend of 95% Marsanne and 5% Roussanne that was fermented in old oak barrels for eight to 10 weeks with partial ageing on fine lees. The bouquet reveals fabulously fragrant aromas of peach, vanilla and honey, which follows with an intense concentration of pure fruit flavours on the palate to end in a dazzling finish. The Cuvée Classique Hermitage Blanc is 100% Marsanne, a rare jewel in the Rhône Valley, if not all of France. It comes from a plot in the Greffieux vineyard that is known for its wines of great finesse. This cuvée first starts with 15-year-old vines and then ends with its vinification and ageing in old oak barrels to give a richly-textured wine with an elegantly scented almond blossom bouquet. If you have the patience, this cuvée can be cellared for 5 to 15 years. Domaine Marc Sorrel continues to enchant wine lovers with both its exceptionally crafted, world-renowned cuvées and with mesmerizing appellations that cast their spell on all those who step foot upon them.